During class Sensei taught a sword concept coming from the Gyokko Ryū called engeki ken (縁隙剣). When you apply it, you connect (en) your sword (ken) to the gaps in uke’s armor (geki). The blade is the center of your body movements, and you turn around uke to find an opening. In the Bujinkan, the sword is used more as a shield than as a cutting device and the body makes it possible. There is no tension no hard blocking, only precise footwork allowing you to get uke’s balance and creating opportunities to counter him. The theme for this year is Goko Goshin (悟光護心) (1) which translates as “the light of enlightenment protecting the heart/spirit”. 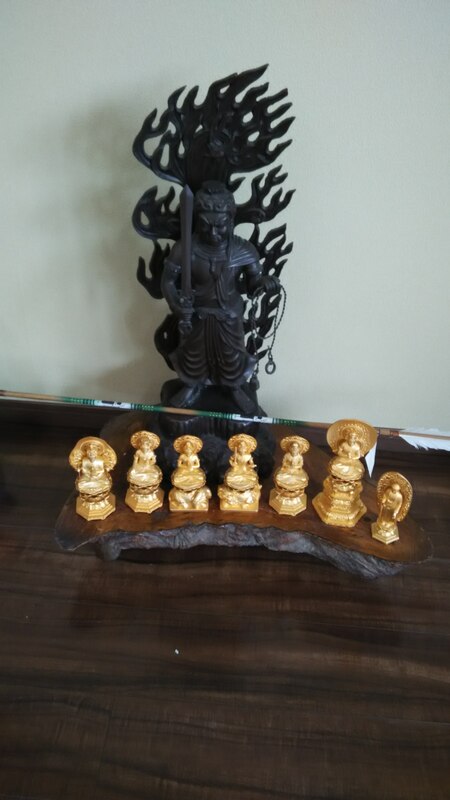 When you visit the new honbu dōjō, you will notice eight golden statues of buddhas and bodhisattvas lying under the shinden (2). They are the protectors of the eight directions (N, NE, E, SE, S, SW, W, NW). They are here to protect the dōjō as a whole, and us during training. I began to understand why Sensei chose this yearly theme when told the following story. We all know that Sensei collects old weapons. Visiting recently his regular antique shop, he saw a beautiful sword. When he unsheathed the blade, it was carved with the “Hassō butsu”, those eight guardian Buddhas of the zodiac. He saw that as a good omen for the new honbu dōjō he bought it. Then he put the statues of the Hassō butsu in the Shinden as a protection. There is also a giant eagle on the left side (Takamatsu sensei’s favorite bird). On the right side is an Ironwood statue of Kanjin (Jiangzhen) a Chinese monk who brought Buddhism to the country in the 8th century (3). We are fully protected! The sword is also a means of protection, and therefore I see here a direct link with the concept of “engeki ken”. When using the sword we have to shield our body with this connection to the opponent through the blade. Once again, the Bujinkan is about footwork and the body rotates around uke keeping the blade between us. When Sensei moves, he does it in such a natural manner that the attacker doesn’t know what he is facing. During the class on Sunday, he took us Pedro and me as uke a few times. And each time we were defeated even before attacking. It felt like fighting a ghost. There was nothing to generate a reaction from our part. Every move sensei was doing was like he was not there. As Pedro explained: “sensei is destroying my confusion.” Sensei’s non-presence creates such confusion that we are dead before doing anything. It was a very strange feeling. After the class, a group of students went to Sensei’s house in Saitama to help Sensei clean the Takamatsu memorial from the growing weed. It was a very pleasant moment. After the cleaning was done sensei offered us a drink and spoke a lot about happiness and being relaxed. Those who were lucky to be there that day will remember forever this precious afternoon in the garden under the sunny sky. Thank you sensei for this beautiful day in the dojo and the garden. *The Hasso butsu are also related to the trigrams of the I Ching. Next Post Roppō Kuji No Biken? Again? Thank you for your teachings, sensei!